Say Goodbye to Paradise Pier! This week Disney’s California Adventure wraps up operations on Paradise Pier, making way for construction crews to begin work on transforming the area into “Pixar Pier”. This newly imagined area will feature all your favorite Pixar Characters. California Screamin’ will be transforming into the Incredicoaster and the Fun Wheel gondolas will each be getting a makeover with a different Pixar Character. Right behind the Fun-Wheel the boardwalk games will be undergoing re-theming along with Ariel’s Grotto and Cove Bar to join the Pixar family. Keep a look out for an Inside Out area on the pier as well! 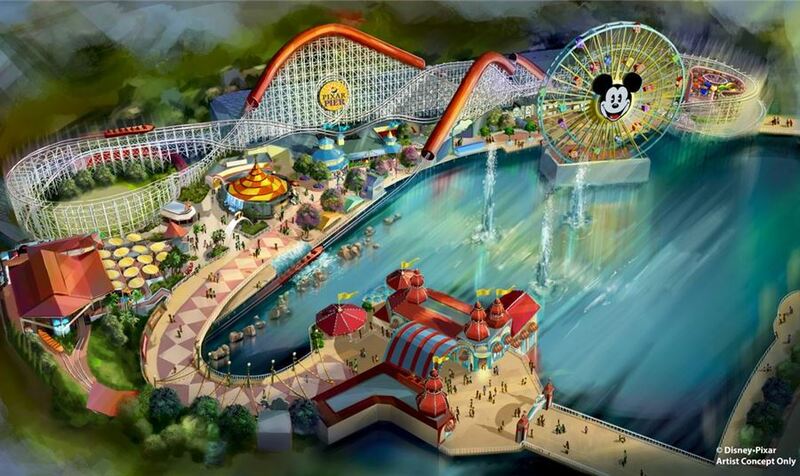 The area including Paradise Gardens, Silly Symphony Swings, Jumpin’ Jellyfish, Goofy’s Sky School, Golden Zephyr, and The Little Mermaid, Ariel’s Undersea Adventure that is currently park of Paradise Pier will become a new land called Paradise Park. These changes will come together in April when the Disneyland Resort begins their Pixar Fest on April 13th. The festivities will take place at both parks. Disneyland will feature a new Pixar-themed firework show. The Pixar Play Parade, previously located at California Adventure Park will now be dancing down Main Street, with an all new Pixar-themed float. California Adventure Will premier their new Pixar Pier along with adding the popular “Paint the Night” Parade to their evening line-up. With the newly announced Southern California Resident discount Tickets available until Mid-May and the heavy summer season starting right after that, you can expect big crowds around these new attractions while the experience lasts.